On Oct 19, 2016, Macsome Inc has upgraded iTunes / Apple Music Converter to the new version V2.0.9 for Mac OS X users. 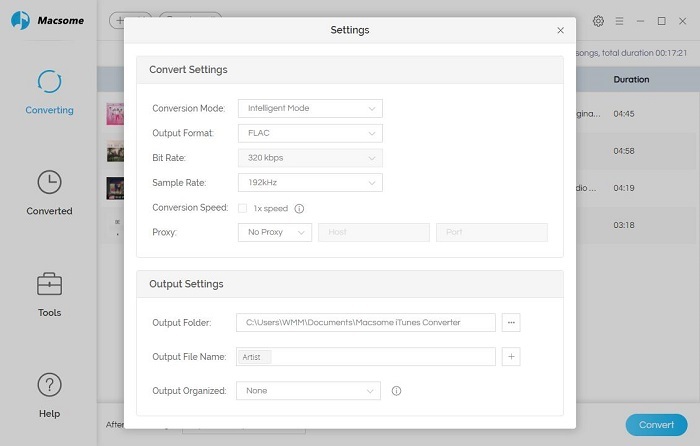 With the latest version, you can set FLAC audio format as the output format. Referral reading: FLAC, short for Free Lossless Audio Codec, is an audio coding format for lossless compression of digital audio, and is also the name of the reference codec implementation. Digital audio compressed by FLAC's algorithm can typically be reduced to 50-60% of its original size and decompress to an identical copy of the original audio data. For the registered users, now you can find the license information on the registration window. If you update to the iOS 10, your conversion maybe occur some one error, now we have fixed the related errors. Hope you have a nice try. The Apple Music Converter can easily convert purchased audio tracks and subscribed Apple Music files to MP3, AAX and FLAC. After the conversion, you can play the converted files on any MP3 players and iPod, iPod Touch, iPhone, Zune, PSP, Creative Zen with 5X higher conversion speed and CD quality. Moreover, it is also a professional FairPlay DRM Removal to help you remove any limitations from the protected audio tracks and then you can play them on any players as you like.